Inducted 1998. Two-Time NAIA All-American in Soccer, Enjoyed Lengthy Professional Career. Before going on to a successful professional soccer career that is matched by few, Koetters’ soccer career got its start in Quincy when he helped Quincy Notre Dame to three consecutive state tournament appearances. After QND lost in the 1983 state tournament quarterfinals, Koetters returned as a junior to record 17 goals and 15 assists and lead the Raiders to the 1984 state championship game, which it lost to Palatine Fremd in a penalty-kick shootout following eight overtimes. Koetters followed with 15 goals and 13 assists as a senior, including an assist on the gamewinning goal in the final two minutes that gave the Raiders a 2-1 victory over Collinsville in the 1985 state championship game. He was also a two-year starter on the boys basketball team, averaging 4.9 points as a junior and 10.1 points as a senior. Koetters went on to become a two-time NAIA All-American while playing for Rockhurst College from 1986-90. He helped Rockhurst advance to the NAIA national tournament. Koetters is now in his eighth season with the Kansas City Attack of the National Professional Soccer League. He has been named the Attack’s most valuable player twice and also has been named to the NPSL All-Star Team twice. He was a free agent acquisition by the Attack for the 1991-92 season and went on to be selected to the NPSL’s All-Rookie Team. He had a team-high 50 assists and finished with 135 points the next season and became the first player in the NPSL to have 40 goals, 40 assists and 40 blocks in a season. 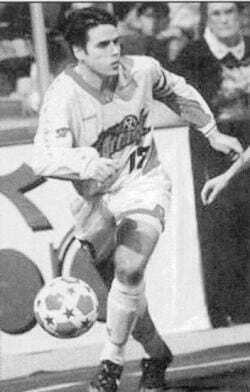 In 1993-94, Koetters had career highs for points (140) and goals (56) and was named to the NPSL’s All-Pro third team. His streak of 119 consecutive games was broken the next season when he fractured a bone in his foot, but he rebounded during the 1995-96 season to lead the team in points (132) and was voted the team’s MVP. He has 662 career points and is only 11 points away from taking over the team lead. He is among the top three in club history in games played, three-point goals, two-point goals, one-point goals and assists. Koetters resides in Kansas City, Mo., with his wife Kathryn.